This page of the official Campovolo site provides all the information about the 19 September Reggio Emilia event. Liga returns to CAMPOVOLO 2015, a great party to celebrate 25 years of career, 25 years of the debut album “Ligabue”, 20 years of “Buon Compleanno Elvis” and “Giro del mondo”. – the best of “Giro del mondo”, accompanied by Il Gruppo. The concert starts at 8:30 pm (doors open at 8:00 pm). The festivities will get underway a day early in Campovolo, at the Liga Village, with “Aspettando Campovolo”, on Friday 18 September from 3 pm to midnight! 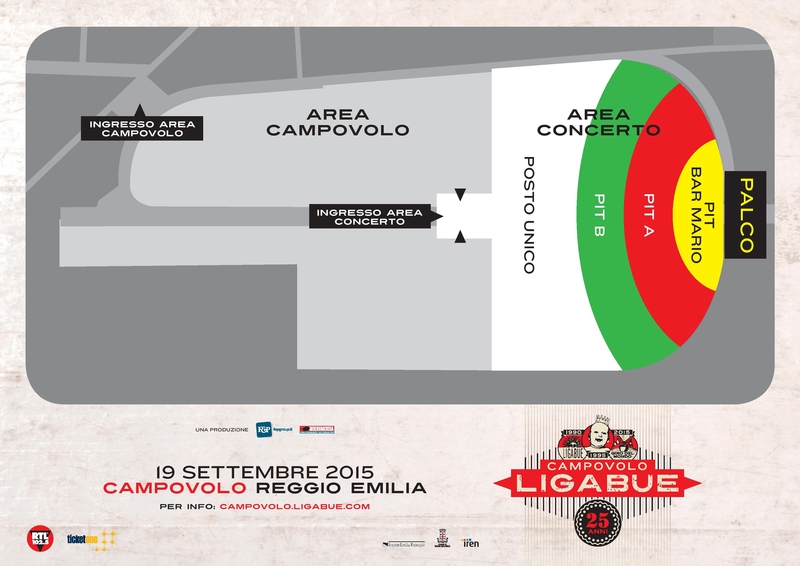 The Liga Village will be set up inside the Campovolo area and will be open for everyone who has already purchased a ticket to the concert. “Aspettando Campovolo” will be animated by street performers (artists, professional jugglers and musicians) and the movies directed by Liga, “Radiofreccia” and “Da zero a dieci”, will be screened. Besides many areas selling food (the prices will be controlled by the organizers), the area will also have a Ligastory area, where Ligabue’s career can be relived through images and exhibits, and a Hot-Air Balloon area where a view from above of this wonderful party can be enjoyed! or FIND the closest point of sale. All tickets cost 50.00 Euros (including the pre-sale charge). Everyone who buys a ticket will receive or can pick up the “Special Box Campovolo 2015“. The gates at “CAMPOVOLO – LA FESTA 2015” will open at 08:00 on the day of the event, 19th September 2015. If you purchased your ticket for Campovolo 2015 well ahead of time (by 30 June or by 18 August, online with delivery by express courier) you will be entitled to enter, wearing the bracelet you received along with the ticket, one of the Pit Areas which extend from the stage right through the concert area (see the MAP of the PITS). Who can access the Pits? Everyone who has purchased their ticket at any time without delivery by express courier and/or after 18th August can access the area called “Posto Unico” (General Admission). Only fans who buy their ticket online choosing the “Ship to home” option will receive the ticket and a Special Box shipped to their home address, as well as a wristband to access the “Special PIT” area, by 30 June. 26/05 UPDATE! Tickets for special seating with a red wristband for access to the PIT A Area are sold out. The special seating tickets with a green wristband for the PIT B Area will be available for purchase starting 27 May at 11 am. Pick up your Special Box Campovolo 2015 directly at Campovolo, at the Ticketone ticket office when you collect your ticket. One box per ticket purchased. Pick up your “SPECIAL BOX CAMPOVOLO 2015” directly at Campovolo, showing your ticket at the pick up desk. One box per ticket purchased. No claims will be accepted after 19 September 2015 if the box has not been picked up.